5br/4ba, Sleeps 16, Fenced Yard, Pet Friendly, Close To Beach,Attractions! Hidden Paradise is custom built with beach style landscaping, spacious 3500 sq. ft. easy living floor plan has a huge great room with fireplace and a 50 inch Plasma TV/DVD player. Large Custom built galley kitchen with breakfast room and snack bar and formal dining room that comfortable seats 15 people. Kitchen is equipped with quality cookware/Commercial 3 Pot Bunn Coffee Maker/Lobster Pot/Waffle iron/Local Cookbooks/utensils,blenders/food processor/toaster/can opener/pizza cooker. Sun room 1- Queen sofa sleeper with accordion doors that provide privacy that can be used for a spare bedroom that over looks the swimming pool. 1- Queen sofa sleeper in living room. There are 4 bedrooms on bottom floor and one bedroom upstairs. All bedrooms furnished with TV and dvd player. All bathrooms furnished with 2 bars of soap 1 roll of toilet paper per bathroom and bath towels. Plenty of movies to put on the big screen. Private Spacious Gunite Saltwater Swimming pool with large screened enclosure. 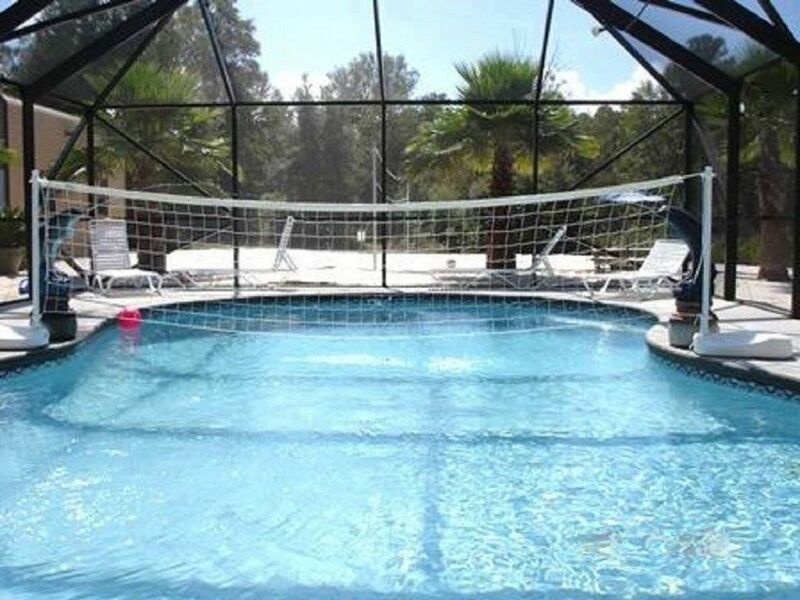 Have a great time playing Aqua Volley inside pool. The children will spend numerous hours playing in the large sandy area with beach buckets and shovels provided by Blue Dolphin Manor plus a teeter totter,tether ball,volleyball set, bean bag toss and horse shoes and a fenced in back yard for your pets..
We keep our prices low so that you will come back year after year. Our homes are very clean and well maintained. Occupancy load for this home is 20! HIDDEN PARADISE" is just a few minutes to the white sandy beaches of Gulf Shores and the new OWA amusement park. There are several activities near by such as OWA, the new amusement park that just opened 2017 that has several amazing rides and only a 10 minute drive and also there are several dolphin cruises,fishing,para-sailing, jet ski rentals, several shopping outlets, a movie theater, golf, zoo, race tracks, mini golf, arcade center, water park and not to mention the BEAUTIFUL BEACHES! We are famous for our restaurants which include, LuLu's, The Hangout, The Wharf, The Oyster House. Ryan's, O'Charlies, Shrimp Basket, Nolan's Dance Club and Lambert's Throw Rolls. If you love fishing, golf, walking on the beach, sunning on the beach or swimming this is the place to be. The fresh seafood served in local restaurants can't be beat. Gulf Shores is rapidly becoming a golfer's paradise. There are a wide variety of courses in the area, ranging from local municipal courses where you can always find a game, to the ultra exclusive beach side resort courses which are truly world-class. In Gulf Shores, there is something for every member of the family. Weddings, Receptions and Reunions are welcome at our vacation homes. We have three luxury homes that are side by side that will accommodate 48 total guests. Vrbo ID Listing #189746, #209817 and #813997. All houses are well equipped for Vacations/Weddings/Family Reunions/Corporate events. Rent one or all and have a blast. I have owned another home in this neighborhood for the past seventeen years and have loved every minute. Now I have decided to offer this new home for YOU to enjoy. You will have Peace,Tranquility and Relaxation. The location is close enough to everything, but not so close that you can't enjoy privacy and quiet time. The Unique Benefits at this House: Open and spacious enough for Any gathering or Special EVENT; Multi-Family Vacations, corporate retreats, family reunions, Golf outings, Anniversary celebrations, etc. 3 separate zones for complete comfort anywhere in the house. Traveled with another family. House was very spacious. Backyard was perfect for the kids to play and the dog to stay fenced in. House was very clean and well put together. Owners very responsive and helpful. We enjoyed our time. We really enjoyed the house and being this was our first time of renting a home. We really enjoyed it and would definitely do it again. We loved the house! Especially was bigger then last year house! But everything was great! We loved it!! We love coming here to stay for spring break! A lot of room for 11 people! We had some great volleyball games! Thank you!! The house was Amazing! I'm so happy you and your family had a great time at Hidden Paradise. Loved staying in a home rather than a condo. Our large family had plenty of room to play! We really enjoyed the pool! The accommodations were great and the owner was always available to help if we had questions! Thank you Nicole for the nice comment and we are so happy you all enjoyed your stay. Come back and see us! My family loved this home! Other than the DVD being inoperable, we had no issues. The smaller kids and young adults loved the sand-filled back yard. It gives you a sense of having your own little beach. Our family spent most of the time in the kitchen which was a plus. The kitchen is open enough to have a bunch of women running around preparing Christmas dinner. We passed by an active family fun park and they had fireworks every night. It was definitely amusing to watch from the house. Would recommend this home to anyone seeking to get the family under one roof! We are minutes from all kind of family activities including Water ville USA / Several Golf courses/The Gulf Shores Zoo/ The Wharf of Orange beach includes live concerts/Huge aquarium. Go carts/Putt Putt Golf/ Tanger Outlet center .Old Time Pottery.Apple B's/Ryan's steakhouse /Cracker Barrel/Original Oyster House(Great Seafood)Lambert s Home of the tossed Rolls(Good place to eat)Logan's Roadhouse /Pizza hut/and so many more good places to eat. Administrative fees includes $250.00 refundable damage/security deposit that will be returned within 30 days after departure and $100.00 nonrefundable credit card processing fee Rental Agreement available by contacting owner when booking. Pool can be heated during winter months for an additional fee. Thanksgiving & Christmas Holidays requires a 4 night min stay at $400.00. Additional information about rental rates: $250.00 Refundable Security/Damage. Nonrefundable $15.00 per day per pet fee + tax. Holidays requires a 4 night min stay. Owner's cancellation policy available by contacting owner when booking. Rate chart reflects the lowest published rate for entire season. Actual rates for specific dates may vary. Please select travel dates on right and click Detailed Price to verify the exact rate for your stay. Promotional rates are offered periodically. Discounts are not applicable to existing reservations.